Another day with a house full of family and a few dozens errands to knock out. Tonight Mrs. E. and I will attend a fundraiser for “Fetch-A-Cure” where the dress code stipulates “smart casual”. I won’t be as casually dressed as I am this morning in tan and white seersucker trousers, a tan knit shirt, brown and white spectators by Martin Dingman and saddle belt. This is simply an effort to dress up a bit more than I have to given the nature of the day. A white linen shirt would up the style quotient a bit more and bring the focus a bit more from the spectators up to my face. I’m fighting mightily the impulse to buy a wonderfully subtle Visconti paisley shirt at Leviner Wood for that unexpected touch of whimsy (no one expects it from me!) I think it might be the black and white spectators this evening. Whether or not they will be accompanied by the full white linen suit remains to be seen. 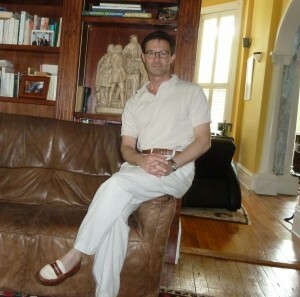 This entry was posted in Elegantology and tagged Fetch-a-cure, Leviner-Wood, Martin Dingman, Visconti. Bookmark the permalink. You look very debonair in your tone-on-tone.